Cosmology is in turmoil. The standard model of a few years ago has recently been abandoned and replaced by new ideas. The reasons for this dramatic change are new measurements of the geometry and the matter contents of the universe. The new model implies a dynamical age of the universe that accommodates the oldest known stellar objects, but raises the need for a dark energy component, which is not readily explained within the current particle physics theories. Most current cosmological models are based on the Big Bang theory, in which the universe started in a hot and dense state. Since then, the cosmic expansion has led to adiabatic cooling, and the subsequent condensations of the matter have formed stars, galaxies and clusters of galaxies. The Big Bang theory predicts not only the universal expansion, but also the baryonic matter content and a relic radiation from the original hot phase. All of these predictions have been observed. The detection of the cosmic microwave radiation and the tiny temperature fluctuations in it are often cited as the most spectacular success of this theory (e.g. Peebles 2001). An extension to the Big Bang theory is the proposed inflationary phase at the very earliest times of the expansion. The inflation would be driven by energy, which emerges from the decay of a particle field and produces a universe many times larger than a simple linear expansion. 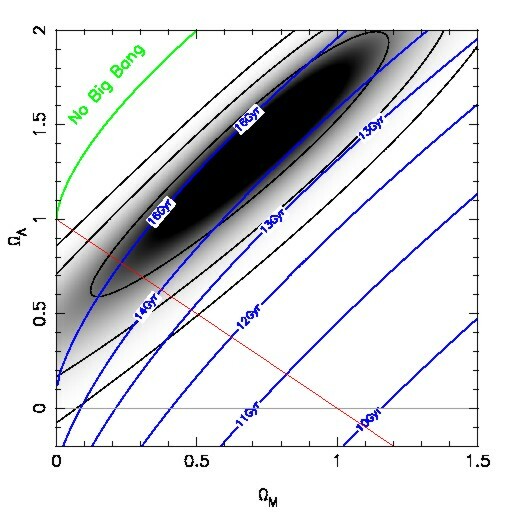 Inflation predicts the seeds for the growth of large-scale structure in the universe. Since the universe would be inflated several orders of magnitudes, it would essentially have a flat space geometry (Guth 1997). Among the open questions in this picture are the matter/energy content of this universe and its future. The average energy density determines the fate of a homogeneous and isotropic universe governed by gravitational forces. It was thought that the matter content governs the expansion of the universe today, while at early phases radiation dominated. In this simple picture the geometry of the universe is directly coupled to the matter density. A flat universe implies an equivalent matter density of about 8.10-27 kg m-3, the critical density. For an average density below this value, the universe would be open and expand forever, while at a higher density it would be closed and eventually re-collapse. Just a few years ago the total energy content of the universe was unknown. All indications were that baryonic matter makes up only about 5% of the critical density (Bahcall et al. 1999). To explain the kinematics of galaxies and clusters of galaxies an additional mass component often referred to as ?missing? or ?dark? mass had to be introduced. The search for direct evidence for the dark matter has, despite substantial efforts, been futile so far. Nevertheless, from observations of the evolution and mass determinations of clusters of galaxies, it appears that dark and baryonic matter could explain about 30% of the critical density. Should the universe be flat, as required if inflation is correct, then some other energy component must contribute to the average density. For a cosmologist, there are only few parameters needed to describe the universe. All models are based on Einstein?s theory of general relativity. The world models are characterized by two parameters: the current rate and the deceleration of the expansion. The first parameter is called the Hubble constant after Edwin Hubble, who discovered the cosmic expansion in 1929. The other parameter describes the change of the expansion and depends on the energy density and the curvature of the universe. The contributions to the density are expressed as fractions of the critical density and are denoted by the Greek letter W, e.g. WM, for the matter density. The expansion itself is typically measured by the redshift. This is the ratio of the scale factor at two different times of the expansion and observed as a shift of spectral features to longer wavelengths. Hubble?s law states that for small distances the redshift is proportional to the distance. Fig 1 A series of observations of a distant Type Ia Supernova. The object is located in a galaxy at a redshift of z=0.51 corresponding to a look back time of about 40% the age of the universe. The observations were obtained with the European Southern Observatory 3.5m diameter New Technology Telescope at the La Silla Observatory in Chile. The change in image sharpness is caused by the varying atmospheric conditions in the individual nights. The supernova at its brightest phase is about 15 million times fainter than what can be seen by naked eye. The light curve of this object has been derived from the images. This diagram displays the rise and fall of the supernova brightness as a function of time. The red line indicates the evolution of a typical nearby Type Ia Supernova. Magnitudes are a logarithmic scale of observed energy flux. At large look-back times and distances the linearity of Hubble?s law breaks down and the distances depend on the energy density of the universe. The various constituents, typically matter and radiation are considered, contribute in different ways to the energy density. Radiation ceased to be gravitationally important at a redshift of about z=1000, a time from which we can only measure the cosmic microwave background radiation. Another component is the famous cosmological constant introduced by Albert Einstein to reconcile the solutions of his equations with a static universe. He later abandoned this term, when Edwin Hubble discovered the general expansion of the universe. For many decades the cosmological constant was not considered in the world models as there was no obvious reason to include it and as it was not possible to connect it to any particle theory. In modern terms, it represents the contribution of the vacuum energy (Carroll et al. 1992). The last three years have seen truly exciting progress in observational cosmology. The flat geometry of the universe has been confirmed by balloon-borne experiments that measured the fluctuations in the cosmic microwave background. The physical scale of these fluctuations can be determined from first principles and the measurement of their angular extend on the sky gives a direct indication of the geometry of the universe. All experiments agree that the universe is most likely flat (de Bernardis et al. 2000, Balbi et al. 2000). A complementary approach to determine the geometry is through the measurement of distances. This approach actually measures the deceleration due to the gravitational attraction, which slows down the cosmic expansion. The amount of deceleration hence directly determines the average density. Cosmological distances are, however, notoriously difficult to attain. The long and arduous history of the determination of the Hubble constant painfully reflects this difficulty. Even today, it appears that the value of the Hubble constant is uncertain to about 10%. The easiest way to measure distances is through standard candles, i.e. objects with identical absolute luminosity. Many candidates for standard candles have been proposed. Only few astronomical objects have turned out to be suitable. Fig 2 Diagram displaying distance vs. redshift for Type Ia Supernovae. These diagrams are generally referred to as Hubble diagrams, as they are similar, but not identical to the original diagram showing the expansion of the universe. The upper panel shows the conventional form of this diagram. 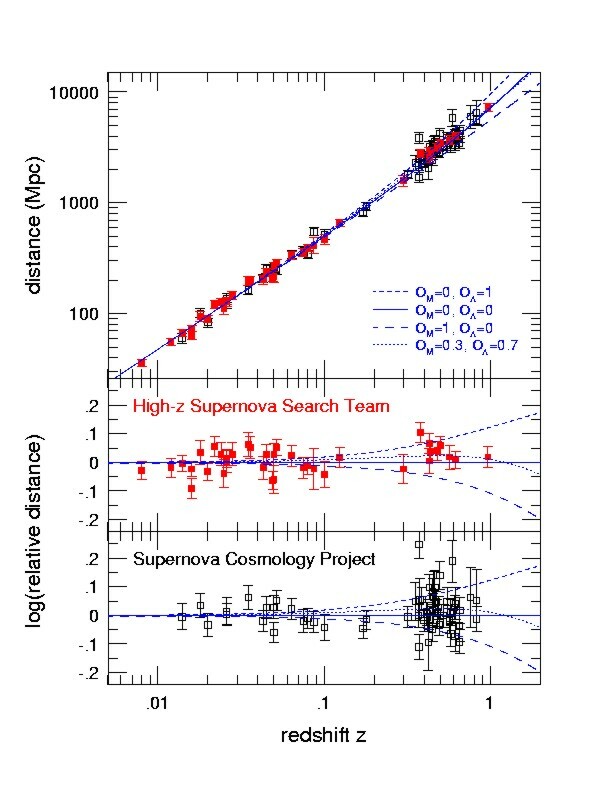 The points are the supernova measurements assembled by two independent groups, the High-z Supernova Search Team (Riess et al. 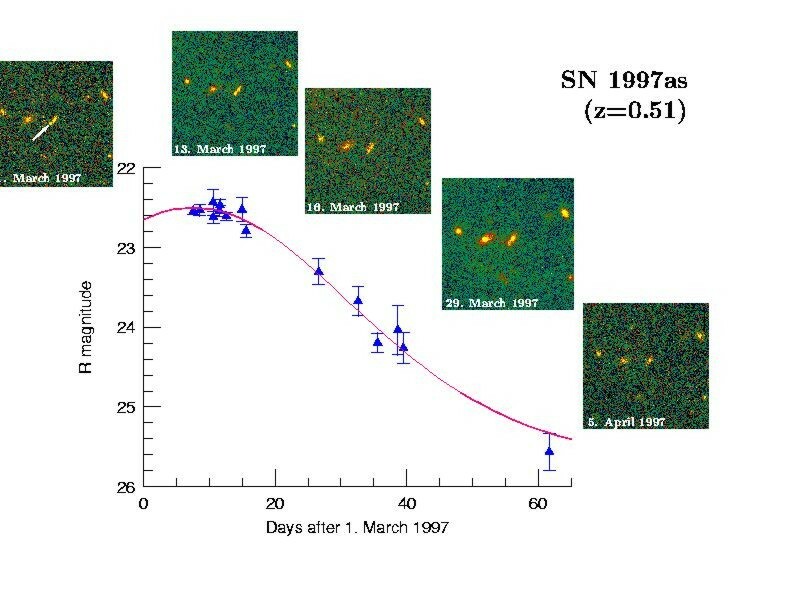 1998) and the Supernova Cosmology Project (Perlmutter et al. 1999). The nearby supernovae have been measured over about one decade, while the distant objects have been observed in short campaigns of a few months length. The lines represent the expectations for a standard candle -in the specific world models. They represent an Einstein- de Sitter model in which the universe is completely dominated by matter (WM=1.0, WL=0.0), an empty universe (WM=0.0, WL=0.0) with nothing in it, and a universe dominated by the cosmological constant (WM=0.0, WL=1.0). The dotted line is a model which is consistent with all current data and has WM=0.3 and WL=0.7. The location of the model lines is set by the data for the nearby supernovae. The lower panels show the same diagram normalised to the model of an empty universe. It is obvious that the distant supernovae lie above the line for an empty universe by about 20% in distance and require some contribution by the cosmological constant or quintessence. The favoured model predicts a non-monotonic behaviour of standard candles in this diagram. A prime candidate for such a standard candle is a certain type of stellar explosions. Known to astronomers as Type Ia Supernovae these explosions occur at the end stages of stellar evolution, when low-mass stars exhaust their fuel and start to contract and cool down. The resulting white dwarfs are so compact and dense that they are supported by electron pressure. It can be shown that there is an upper limit to the mass supported by the pressure of the degenerate electrons. This Chandrasekhar limit, named after Subrahmanyan Chandrasekhar, is near 1.4 times the mass of the Sun. A single, isolated white dwarf will not change its mass, but a white dwarf in a double star system may acquire mass from its companion. If this process is efficient enough, the white dwarf will turn itself into a thermonuclear bomb that will burn carbon and oxygen explosively to nuclear statistical equilibrium. For the density and pressure in these explosions this is mostly a radioactive nickel isotope (56Ni), which decays through g-decay to 56Co and further to stable 56Fe. The energy is deposited in the star and blows it apart. Such an explosion can outshine the light of a whole galaxy made up of some 1010 stars (Figure 1). The Chandrasekhar mass is a natural limit and makes it conceivable that all Type Ia Supernovae are similar. Such a uniform constellation assures that there are only small differences between individual explosions, a prime condition for a standard candle. Supernovae are extremely rare. A galaxy like our Milky Way may produce a Type Ia Supernova only every 400 years. Hence, one has to observe a large number of galaxies for quite some time to detect a supernova. The sample of nearby supernovae (out to a redshift of about z=0.1) is still rather limited. In fact, well-sampled light curves (e.g. Figure 1) are an exception and it has taken over a decade of dedicated effort to collect a significant sample of objects. In the process a lot has been learnt about Type Ia Supernovae and their physics (for a review see Leibundgut 2000). Fig 3 The ESO Very Large Telescope (VLT) on Cerro Paranal in Chile. This new array of four 8m telescopes is an example of what is required to observe the distant supernovae in detail. Only large telescopes, like the VLT, the 10m Keck telescopes on Mauna Kea in Hawaii and the Gemini 8m telescopes in Hawaii and Chile are capable to gather enough light for a detailed analysis. Not all Type Ia Supernovae are identical. However, there is a way to normalise their peak luminosity according to their light curves. More luminous supernovae display a slower temporal evolution. In this way, it is possible to normalise all objects to the same peak luminosity and make them exquisite standard candles. One way to empirically test the quality of a standard candle is to look at the distance vs. redshift diagram (Figure 2). For a redshift below z=0.1 the scatter around the line of linear expansion is extremely small and proves that, at least in the nearby universe, the supernovae can be used as distance indicators. Direct determination of the absolute luminosity of Type Ia Supernovae has recently been obtained for the 10 nearest supernovae which exploded within the last 60 years. The peak luminosity of these objects is indeed very uniform. Fig 4 Probability distribution of WL vs. WM from the supernova data. The greyscale gives the probability distribution as derived from the supernovae shown in Figure 2. The contours are drawn at 68.7%, 95.4% and 99.7% confidence level. The preference for a ?dark energy? component is obvious. WL=0 is excluded at the >95% level. The line for a flat universe as favoured by the cosmic microwave background is shown in red. The sloped blue lines indicate the age of the universe for these models assuming a Hubble constant of H0 = 65 km s-1 Mpc-1. The oldest stars have an age of about 13.109 years, which is consistent with the new supernova data but not with the Einstein-de Sitter model (WM=1, WL=0). Distant supernovae, like the example in Figure 1, are more difficult to observe. Since supernovae are such rare events a large volume has to be surveyed to discover a sufficient number for co-ordinated follow-up observations. It was soon recognised that such a project would exceed the possibilities of a single observatory or group of astronomers. In fact, this experiment makes use of all the largest telescopes available. 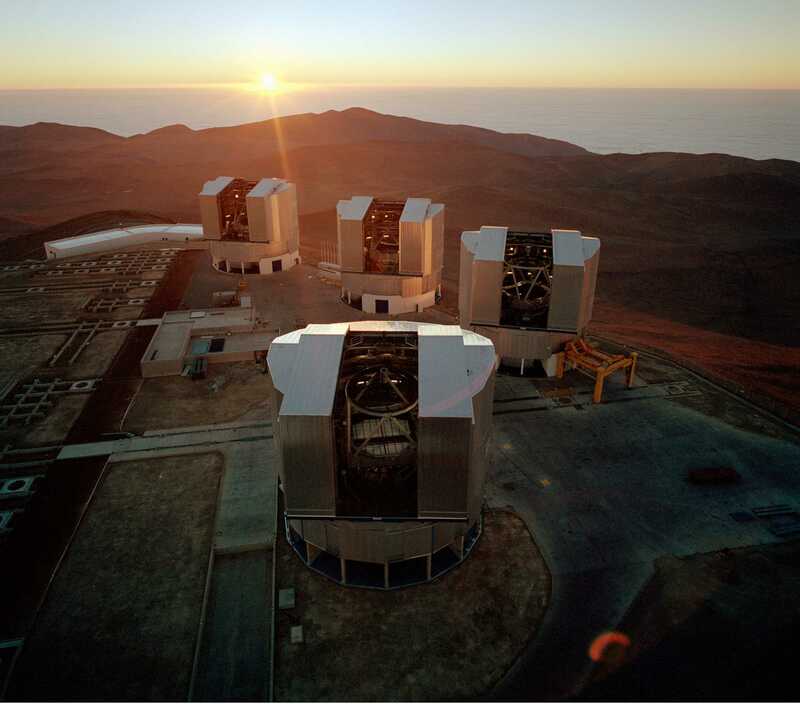 A typical campaign involves the European Southern Observatory VLT (Figure 3), the Keck telescopes, the Canada- France-Hawaii telescope, the Cerro Tololo Inter-American Observatory and the Hubble Space Telescope. The supernovae are observed for about two months with all available telescopes. The resulting light curves, like the one shown in Figure 1, are analysed to derive the peak brightness and plot them in diagrams like Figure 2. With the model lines calibrated by the nearby supernovae the distant explosions tell us how much the universe has expanded between then and now. From Figure 2 it is obvious that the distances are larger than what would be expected in a freely coasting, i.e. empty, universe. Even worse would be a fit for a flat and matter-filled Einstein-de Sitter model. The distant supernovae are simply too faint, i.e. too distant to be compatible with the old paradigm of a universe filled with matter and radiation only. There has to be a component to the energy density that has accelerated the expansion over the last ~6.109 years (Riess et al. 1998, Perlmutter et al. 1999, Hogan et al. 1999, Riess 2000). An obvious candidate is the cosmological constant. With the supernova result it appears that it should be re-introduced to explain the data. Another possibility is that the cosmological constant is indeed zero, but that there is a particle field that through its decay acts like a cosmological constant. It has now come to be known as ?quintessence? (Ostriker and Steinhardt 2001). Independent of which explanation is correct we can designate the energy density of this ?dark energy?? as WL. Figure 4 shows the probability distribution between the matter density WM and WL as the supernova distances define them. It is obvious that models with WL=0 are excluded at the >95% level for all models with a positive matter content. This comes from the fact that an accelerating, negative-pressure component is required, which can not be achieved with matter or radiation. A nice feature of world models with these parameters would be that the dynamical age of the universe is no longer in conflict with the ages of the oldest stars in our Milky Way. We have marked the isochrones of the dynamical age for the combination of WM and WL in Figure 4. Fig 5 Comparison of spectra of nearby and distant supernovae. Spectra of seven distant Type Ia Supernovae observed with the VLT (blue) are compared with nearby objects (red) at the same phase. The distant objects look remarkably similar to the nearby ones. This is an important check as the spectra are ?finger prints? for the chemical composition of the supernova ejecta. Contamination of galaxy light or reddening of the objects due to dust can cause changes in the slopes of the continuum emission. The result from the distant supernovae that the expansion of the universe is not decelerating but in fact accelerates is certainly surprising. We should answer the obvious question how secure this result is. There are a few other possible explanations for the faintness of the distant supernovae. They are an intrinsic evolution of the peak brightness of the supernovae, unrecognised dust, or gravitational lensing. Evolution has been the downfall of all previously proposed distance indicators. Take for example regular galaxies. Looking back for several 109 years means that a galaxy is composed of stars, which are on average younger than the ones currently in our Milky Way. Since a galaxy with young stars has a larger fraction of short-lived, massive stars, which are brighter and bluer, it will change its luminosity over time. Could Type Ia Supernovae also suffer from evolutionary effects? At first glance, such an evolution is less likely. According to the current models they are explosions of stars, which always end up in the same configuration, a white dwarf at the Chandrasekhar limit. However, even though the bomb always has the same mass, its composition may vary slightly. The explosive carbon burning in a white dwarf depends on the mixture of carbon and oxygen. One could imagine that the distant supernovae have had a different chemical composition at the explosion than their nearby counterparts. Also, stellar evolution predicts that younger white dwarfs are the descendants from predominantly more massive stars. Thus, the parent population of the distant supernovae could be different from the one observed nearby. Unlike for the nearby supernovae we can not use the linear expansion law to check for consistency. What has been tried in the last few years is to make sure that the distant objects have the same appearance as the nearby ones. This program is still under way, but first results are already becoming available. The observed spectra of the two populations are so far indistinguishable (Figure 5). 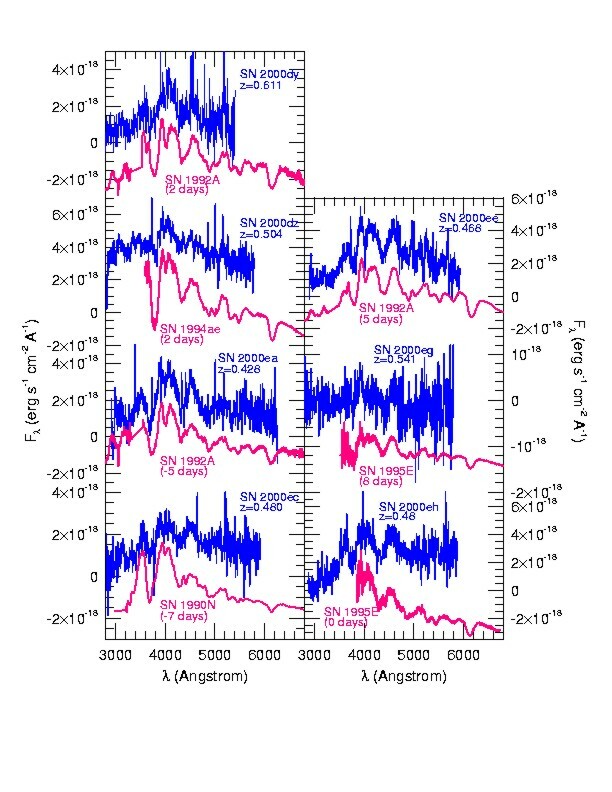 There is further a very characteristic light curve shape with a second maximum of Type Ia Supernovae in the near-infrared, which by now has also been observed for the distant supernovae. On the other hand, there appears to be a trend to bluer colours for distant supernovae, which, if confirmed, may hint at evolution. Interstellar dust also dims astronomical objects. Galactic dust distributed in the plane of the Milky Way is the reason we can not observe the Galactic Centre in optical light. But galactic dust not only dims the objects, it also preferably scatters blue light and makes objects appear redder. If the intrinsic colour of an object is know, the observed light can be corrected according to the galactic absorption law. The colour evolution of Type Ia Supernovae is in fact very uniform and by always obtaining colour information for the distant supernovae we can check for dust and correct the brightness, if necessary. But there is nothing that says that the galactic dust is representative throughout the universe. For example, larger dust particles scatter differently so that the supernovae still would be dimmed but not as reddened. Observing programs to check this possibility have been carried out last year and are currently being analysed. Along the light path of any distant object lie other massive objects. Background galaxies are distorted by the potential wells through which light has to travel and the galaxies are stretched into large arcs, which are regularly observed in massive clusters of galaxies. Another effect of gravitational lensing is amplification or de- amplification of the light. It turns out that distant objects are on average de-amplified, i.e. statistically appear fainter. This would be an obvious explanation of the dimness of the distant supernovae. However, the effect is not large enough, even if all mass would be concentrated in compact objects, and can not explain the distant supernovae. This result is based on model calculations, as this is the only effect that can not be observed with the supernova light itself. There is one signature, which would almost unambiguously prove that the universe has been accelerating over about half its age. This is the deceleration during the early phases of the expansion. The cosmological constant does not change over time, but since the density decreases the gravitational action should have been much larger during the first few 109 years. In Figure 2 this shows up as a non-monotonic evolution. The critical redshift range is around z=1.2, a range that has so far not been explored by the observations. This is stretching the current capabilities of any existing telescope. The supernovae become exceedingly faint and due to the redshift have to be observed at near-infrared wavelengths where the night sky is much brighter than in the optical. Nevertheless, the next observing campaigns will target exactly this redshift range to test whether the acceleration of the universal expansion is indeed the correct interpretation for the dimness of the distant supernovae. There is a big problem with the cosmological constant. In modern particle theories it is associated with the energy of the vacuum, but these theories also predict a value for the vacuum energy which deviates by more than 50 orders of magnitudes from the cosmological observations. Although this has been a problem all along, the supernova measurements have acerbated this problem, by requiring a non-zero but small (<1) cosmological constant. For these reasons many theorists currently favour quintessence models. But this requires introducing a new particle field and corresponding potentials, which have to be fine-tuned to have an action like the observed one. But there is more on the horizon. To distinguish between a cosmological constant and quintessence the time variability of the acceleration should be checked. Tracing the supernova distances in detail can do this. A large sample of supernovae out to a redshift of about z=1.5 is needed. Proposals to obtain such samples have already been made. Type Ia Supernovae together with the recent results on the cosmic microwave background and the masses of clusters of galaxies are consistent with a flat universe, in which about 30% is gravitating matter and 70% is contributed by ?dark energy? (cosmological constant or quintessence). Only about 5% of the total energy stem from baryonic matter. Another 5% may be contributed by massive neutrinos. Bruno Leibundgut and Jesper Sollerman work at the European Southern Observatory in Garching, Germany, and are members of the High-z Supernova Search Team. They have concentrated on the physics of supernovae throughout their careers. While Bruno Leibundgut studied the light evolution of Type Ia Supernovae and characterised their capability as standard candles extensively, he also works on other types of stellar explosions, their progenitor stars and their impact on the local stellar environment. Jesper Sollerman concentrated on the very late phases of supernovae when they reveal their ashes. He has further worked on investigations of the Crab Nebula, the remnant of supernova that exploded in AD 1054.